After failing to get the Crosses removed from the area via legal means, abortionist Tiller responded to KCFL's Project LPPPA volunteers with a sign of his own. 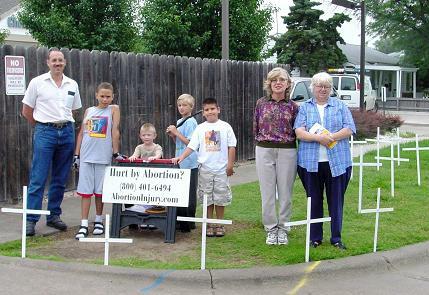 Each day that the Tiller Abortion Facility is open for business, KCFL volunteers set 167 white Crosses on city property adjacent to Tiller's building. 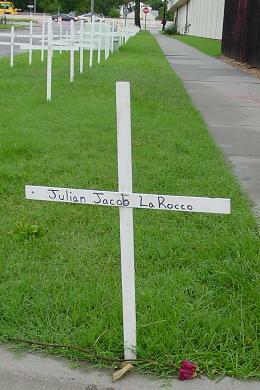 Each cross represents a child that was killed at the facility during the previous month. A distraught father from Indiana left Tiller's waiting room to dedicate one of KCFL's Crosses to his son who was killed by abortion that same day. Before returning to the waiting room, he knelt in prayer in front of this cross. Nine ambulance runs since May of 2004. 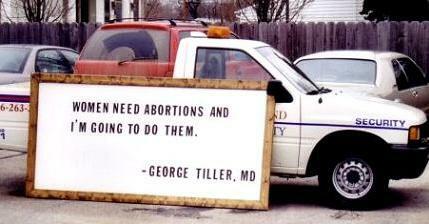 KCFL holds Tiller accountable for any botched abortions that result in the death of the mother. 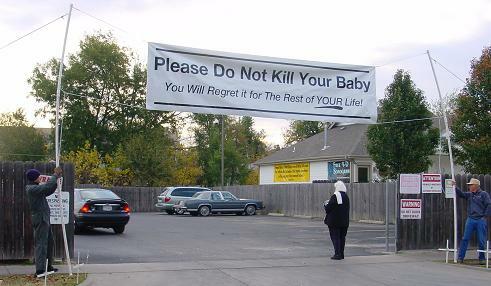 The Crosses invoke a strong public response. 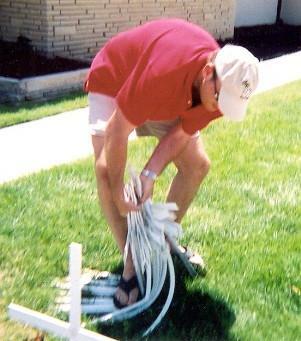 Here above, in 2004, a vandal breaks 149 Crosses to express his feelings about the abortion controversy. In 2016 another confused young man stole twelve crosses, which were recovered by the Wichita Police. To keep from going to jail, the young man wrote an apology letter and KCFL declined to press larceny charges against him. U.S. Senator Sam Brownback accepts the 2005 ProLife Signature Ad from KCFL Volunteer Greg Gietzen. As of today, April 19th, 2019, Project LPPPA has logged 395 saves - - - (this counter is stuck, the actual currnet count is 520) - ...as counted by our conservative counting method. 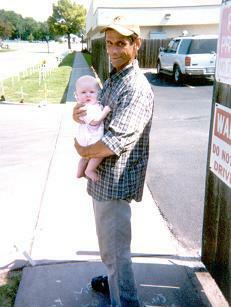 The babies shown here are just two of those saves. Sage Elizabeth, the child on the left, was minutes away from being killed by Abortionist Tiller, when her mother, Andrea, had a change of heart.